The Blair Witch herself may be hundreds of miles away in the woods of Burkittsville, Maryland, but The A.V. Club, being the proud Midwesterners that we are, isn’t about to let Chicago—or our sister city to the north, Milwaukee—get left out of the scary fun surrounding the release of the new Blair Witch movie. Soon after it was revealed at Comic-Con that You’re Next director Adam Wingard’s new, suspiciously Blair Witch-like found-footage movie The Woods was, in fact, an official Blair Witch sequel, Bloody Disgusting’s Brad Miska boldly declared it a “game changer” that will “completely wreck” all but the most seasoned of horror fans. “‘Scary’ is probably an understatement, as this may just be the first film since The Exorcist that will leave younger audiences scarred for life,” Miska writes. That sure sounds like a challenge to us! The A.V. 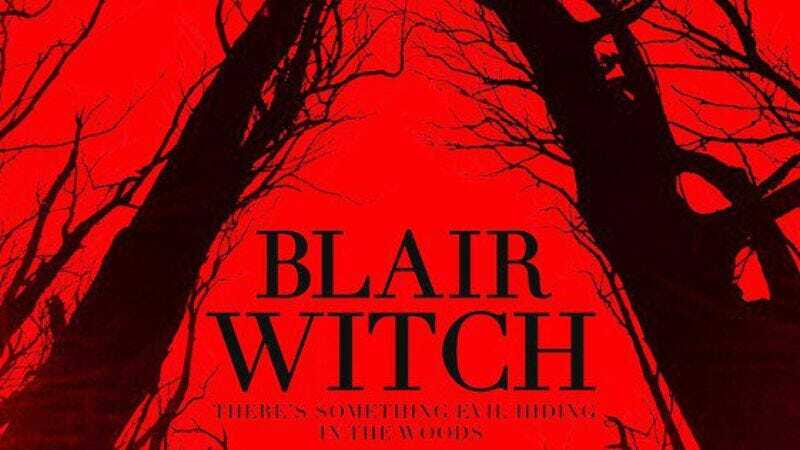 Club is giving our readers a chance to find out if Blair Witch lives up to its immense hype at a special preview screening, taking place at the Music Box Theatre on Wednesday, September 14 at 7 p.m. You can sign up for one of the 40 regular passes to the screening we’ve got available here. Those are first come, first served, and as always, remember that these preview screenings are intentionally overbooked—so be sure to show up early, as this one will be packed. 1. Whitey, the ghost of a former manager, haunts the historic Chicago theater where you’ll find one of the totems. 2. You can find Ghost Rider and Scarlet Witch hanging out in this Lakeview haunt, where supernatural creatures wander up and down Broadway. 3. This unearthly Logan Square greasy spoon—which charges customers only 66.6 percent of their bill on Tuesdays—now has a Blair Witch totem to accompany its evil sounds. 4. When you order a shot at this Lincoln Park pub, save one for the many ghosts of former patrons that haunt the upstairs. 5. Pass by the bears and dragon ladies and you’ll eventually wind up doused in blood when you arrive at this horror lover’s mecca in Avondale. 6. Follow the yellow brick road—but avoid the curse of the billy goat!—when you stop in for a cup of black magic at this Wrigleyville favorite. As for our Milwaukee friends, we’ve got an opportunity for you to go see Blair Witch, if not early, at least for free at any point during its theatrical run. To win one of these 15 ROE passes, simply fill out this form here, and you’ll be entered to win. The passes are good for two tickets to any screening of Blair Witch at an AMC theater in the Milwaukee area, and winners will be notified by Friday, September 16. So that’s two cities, and three chances to win! You can watch the official trailer for Blair Witch below.